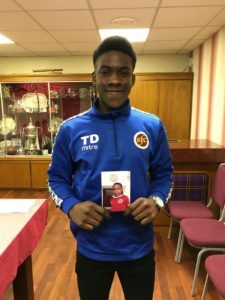 Stenhousemuir Football Club is pleased to announce Tiwi Daramola as a new signing for the first team. Tiwi will make the step up from our Community Under 19s to join the first team set-up and will work under recently appointed first team manager Colin McMenamin. Tiwi originally joined the club at the age of 5 and has progressed from the Young Maroons , through all age groups within the clubs pathway to become the first player to move directly from the community programme to the first team. 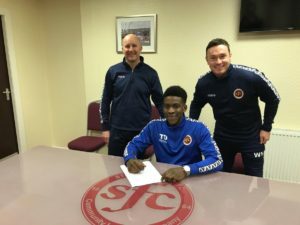 It is a remarkable journey for the youngster and shows what is possible at a community club like Stenhousemuir. Tiwi (17) will train with the squad tonight before joining Bo’ness United on loan. He has already featured for Bo’ness making 2 sub appearances for the East of Scotland side as a trialist, scoring 1 and assisting 2. 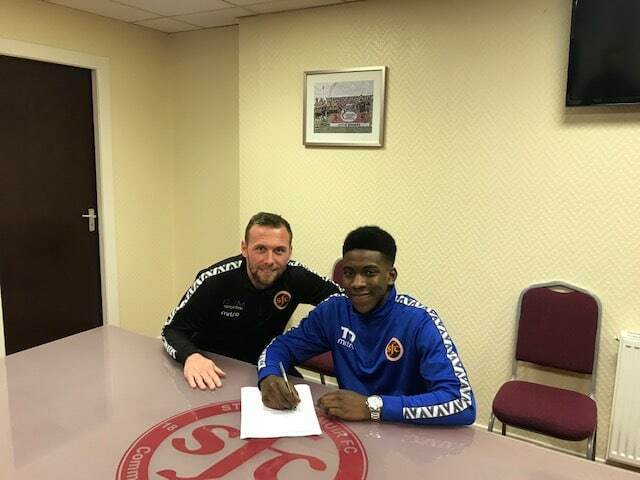 Its a busy week for Daramola as he also has trials on Thursday for the Scottish Schools Under 18 squad. Tiwi was joined at tonight’s signing by first team manager Colin McMenamin, CEO Jamie Swinney, Head of Community Football William Hoggan and U19s Head Coach Wilson Millar. Family Ceilidh- TICKETS ON SALE!! !